For those of you who are big fans of Fuji's fujichrome 50 slide film, your reasons are on full display here. Loved for it's near invisible grain and amazingly saturated earth tones, it was perfect for a shot like this. Now I turned 50 this year and for nearly 30 of them I've been a member of the Bronx Zoo. From my apartment in the Bronx I loved going there in the winter when the crowds are low to capture nice shots of it's inhabitants. Little did I know that this trip on the 11th of February in 1987 would be one of my last here for over 20 years, as in about 4 months I would move out from my mother's apartment and rent one in Staten Island with my best friend Scott. The long trip from Staten Island would prove to be too much to deal with, with so many other things closer to me to photograph. But I always missed my favorite zoo, and went to the Members Annual meeting at Lincoln Center faithfully for many years after. One place I made sure to visit every time was it's famous reptile house. There was always SOMETHING worth capturing there every trip. 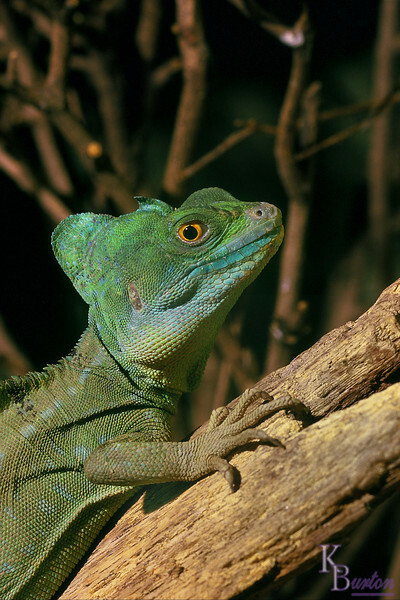 This day it was a male Double Crested Basilisk who's rich colors and fine scales created a spectacular subject for my all time favorite lens to capture. you sure have a keen eye!